Maarten has had an interested in astronomy since he was a small boy. He's been a member of the Society since 1999. 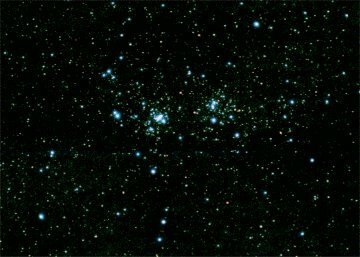 He's especially interested in photographing wide field deep space objects. His equipment comprises of a Helios Apollo 150 f/6.7 short tube newtonian, a Helios Startravel 102 f/5 refractor and a German Equatorial mount with dual axis drives. For imaging he uses either a Pentax K1000 SLR, a Minolta S404 (4Mpix digital camera), a QuickCam Express modified web camera, or a purpose built high sensitivity 640x480 pixels colour video camera using a Sony CCD chip from a decommissioned video conferencing system. 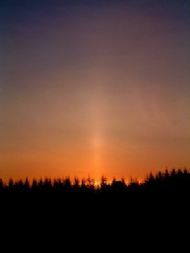 This is still image from a video of a spotty Sun taken on 16 May 2004. I used a very old RGB type webcam with a Belkin USB video bus, version I. It was fitted to my Helios Startravel 102, with Baader Solar Filter, and stopped down to f22. 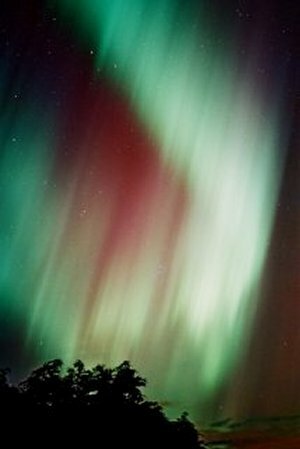 This image was taken from Knockbain near Munlochy on the Black Isle on 30 October 2003 using a Pentax K1000 SLR with standard 50mm lens (f/1.2) and a 10 second exposure on Kodak 800 asa film. 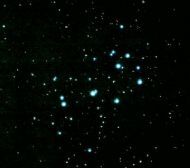 The Pleiades are just visible in the lower section of the red glow. Two photo's take afocally through my StarTravel 102 short tube refractor. The left image was taking through a 25mm eyepiece at 1/125 second F8.0. This was the moon at approximately 10pm with the shadow of the earth covering almost half of the moon. 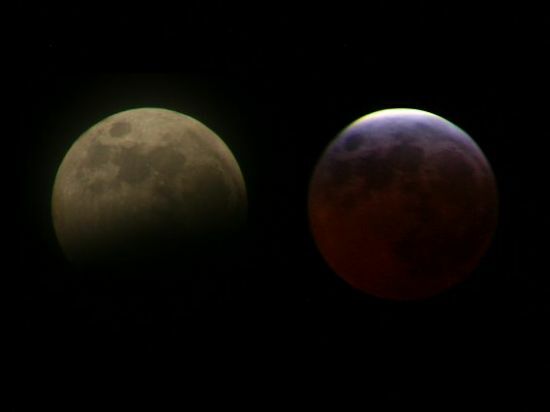 The image on the right was taken using a 32mm eyepiece at 4 seconds f3.6 when the moon was nearly fully eclipsed. 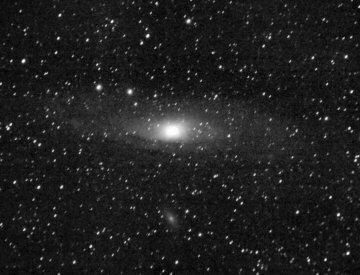 This picture was taken on the 21st of September in 2002 from Knockbain in Munlochy using a Pentax K1000 at the prime focus of a Helios Startravel 102 scope on a driven EQ3/2 mount. The exposure was 10 minutes on Kodak 200 asa colour film. The image was then scanned in black and white. 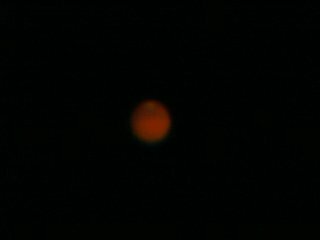 This images of Mars was taken using a Minolta Dimages A404 digital camera through a 10mm eyepiece on the 295mm f/6.5 Society Dobsonian Telescope. The exposure was 1/5 of a second. This images was taken sometime in March before the closest Opposition in August 2003. I took this image early in the year 2001 using a very cheap but heavy Zenit 11 camera with standard lens. I piggybacked this on my Helios Apollo 150 with driven EQ3/2 mount. The exposure was 5 minutes on Agfa 200 film. I then scanned the photograph and zoomed in on this region. 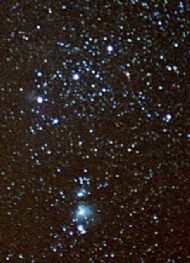 The results are remarkable despite the low cost of the camera and you can even see a glimpse of the Horsehead Nebula! I made this photo of the partial solar eclipse from the garden of our holiday cottage in Aberlemno in Angus on 3 October 2005 at around the maximum. The sky was excellent with the exception of a few contrails and a very slight haze. 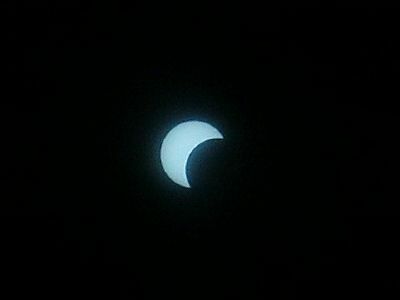 I made this image using a Minolta Dimage s404 digital camera on maximum zoom through one of the lenses of Baader Exclipse Glasses. 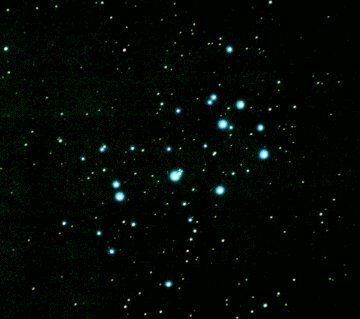 This picture of the Pleiades star cluster (M45) was taken on September 2002 from Knockban near Munlochy using a Pentax K1000 at the prime focus of a Helios Startravel 102 on a dual axis driven EQ3/2 mount. The focal ratio of the setup was f/5 and the exposure was 5 minutes on Kodak 200 asa film. 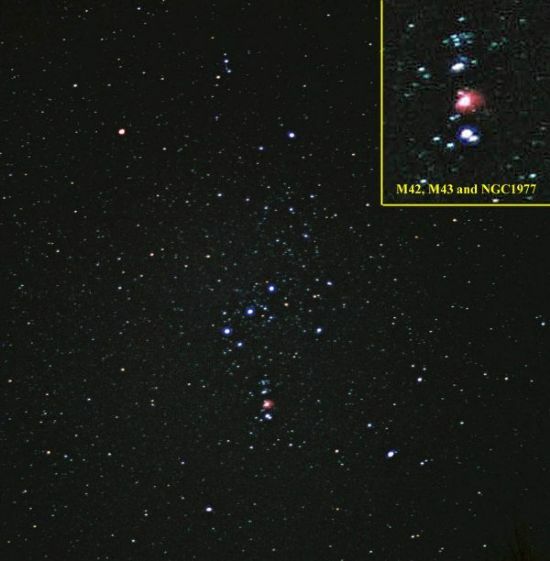 This image from the star clusters NGC 869 and NGC 884 (both known as the double cluster) was taken from Knockbain near Munlochy on 21 September 2002 using a Pentax K1000 at the prime focus of a Helios Star Travel 102 on a driven EQ3/2 mount using a 5 minute exposure on a Kodak 200 asa film. When I let out the dog in the early morning of 22 February in 2003, I noticed this streak of light in the sky, a pillar of light caused by the sun. I'd seen photos and read about it, but had never seen one myself before. 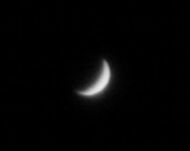 This is one of the better images I have ever been able to take of Venus. It was taken on the 9th of May 2004. The seeing was not even that great, but slow enough to get the odd reasonably well shaped result. This image is taken with a Minolta Dimage 404 through a 10mm Plossl on my Helios Apollo 150 at 1/5 second. It is a single image with no post image processing applied. To return to the Image Gallery homepage click here.